Are E Numbers OK for Children? Home > Diet & Health > Are E Numbers OK for Children? So you’ve read all about E numbers and discovered that some of them may be linked with health issues. Now the crucial question on your mind is are E numbers okay for children to have? It’s a tricky question to answer. On the one hand yes, there are potential health issues to be aware of in connection with some E numbers, especially involving children. But on the other hand, preventing children from eating any E numbers at all is quite a hard task to administer. E numbers are included as ingredients in so many foods and drinks these days that trying to avoid any at all is really tricky. Even if you eat a wholesome and nutritious diet at home, that includes plenty of fresh fruits and vegetables and minimal processed foods, it’s hard for your child to completely avoid E numbers when they’re eating at other children’s homes, at parties, out and about, or even at school. There’s no doubt that some E numbers aren’t ideal for children to consume, especially on a regular basis. 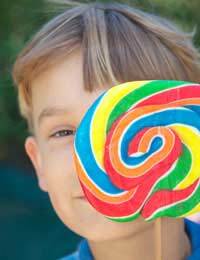 The issue of E numbers and children’s hyperactive behaviour has been debated for years, with suggestions that eating or drinking products containing certain E numbers may increase bad behaviour and affect concentration. As a result of the research confirming the E numbers and their link to hyperactivity, some manufacturers have vowed to remove the suspect additives and re-jig their product recipes. But this doesn’t always happen quickly and other manufacturers may not be so concerned, so you do still need to be vigilant. Studiously checking product labels is ultimately the best way of identifying whether the numbers are included in the ingredients lists. But whilst there are some E numbers that it’s worth avoiding, there are many more that haven’t been linked to health issues and appear to be relatively safe. It may be a case with some that more research is needed, but it’s important not to forget that the E number prefix relates to additives that are both natural and synthetic or manmade. It’s a common myth that all E numbers are additives that are bad for you and are chemically made, as that’s not the case at all. Some of the natural additives include E300, which is actually vitamin C, E162, which is plain old beetroot juice and E601, which is carotene. So there’s no need to be alarmed when you see an E number on packaging as it won’t necessarily be harmful. To summarise, when you’re debating whether E numbers are OK for children to have or not, it ultimately comes down to being aware of the risks of some E numbers and ensuring they’re consumed in moderation, but avoiding panicking unduly about all additives, as some come from entirely natural sources.